The Sudanese people will cast a historic vote Jan. 9 regarding whether or not to secede and form a new nation. The referendum is a latest in the long-fought struggle for peace in the country. The New York Times is reporting that much of the population and government officials will let the event come as it may. Whatever the result, it won’t be unexpected at this point. 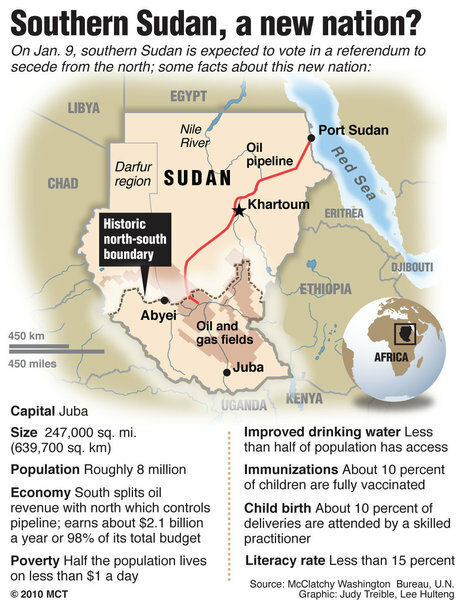 Sudan’s national economy is built on oil revenue. The bulk of that product comes from the southern regions of the country. In the event of secession, oil pipelines will remain intact and the northern, Arab-dominated region of Sudan will still garner some revenue. Depending on how the vote goes, the political makeup of Sub-Saharan Africa will be changed. Right now, the country and much of the international community are preparing themselves for Jan. 9. While peace seems to be resting on the horizon, this day will be emotional in many different ways and violent conflict is something to guard against.